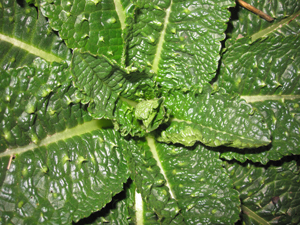 In the first year of growth (teasel is a biennial), the leaves form a rosette on the ground (see adjacent image) - the corrugation of the leaves and their prickly bits are sometimes likened to goose skin. In the second year, a strong and tall stem develops which has opposite pairs of leaves. The leaves are long (30 cm+), toothed and spear shaped. 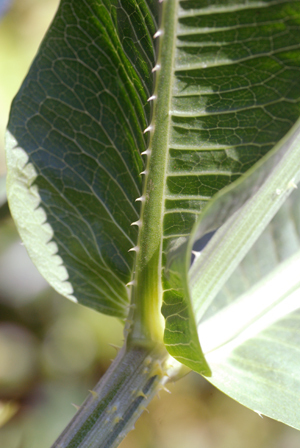 The main vein on the underside of the leaf has numerous prickles - see image. The leaves join where they meet the stem to form a 'cup-like' structure - which collects rainwater. 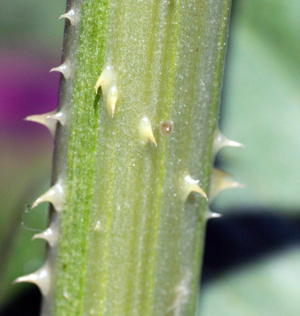 The stem (up to 2 metres) has numerous prickles (see image) and is ridged. The flowers are produced in compact, 'egg-shaped' heads; which contain hundreds of small flowers packed together. This head is surrounded by a number of spiny bracts - see image. 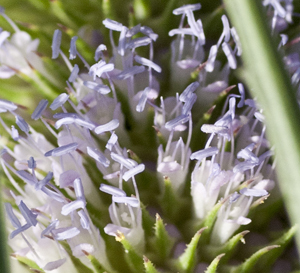 The petals of the flowers are a pale purple / pink colour, and the 4 stamens protrude from the flower. The flowers in the 'middle' of the head are the first to open (flowering is usually July & August). The dried out and dead flowerheads persist on the dead stems throughout the winter months. 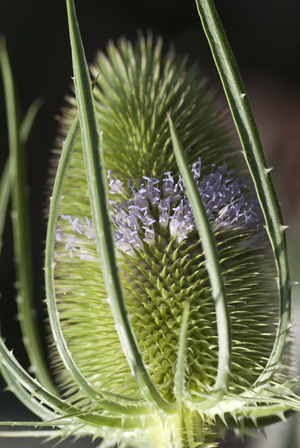 The teasel was formerly the teasing plant of the cloth maker, hence one of its names is 'brushes and combs', which refers to the use of the dried heads (held in wooden frames) to comb the cloth, to raise the 'nap'. This particular job was done by fullers - hence the specific name Dipsacus fullonum. 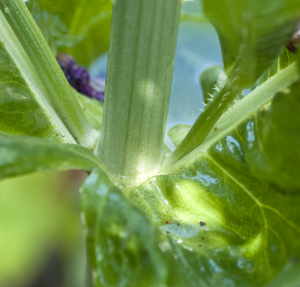 Another name for the teasel is venus' basin - this refers to the water that collects in the base of the leaves (see image). Folklore says that such rainwater has healing properties - see Plants for a future. 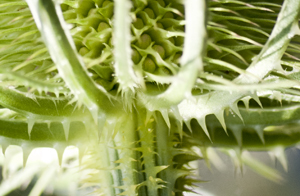 Teasels are found by river banks, footpaths, in rough grassy areas and open woodlands. The seeds of the plant are a useful food source for birds such as the goldfinch.